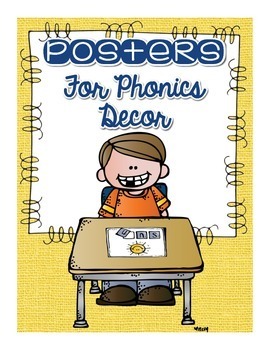 Ever needing CUTE and FUN posters to hang up after you have taken down your anchor charts to help your students remember phonics sounds they have learned? 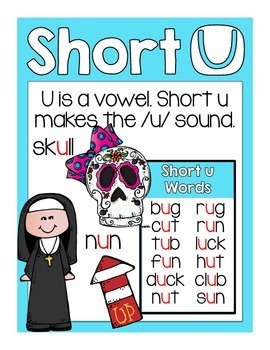 -short vowels: a, e, i, o, and u. -long vowels: a, e, i, o, and u. -blends:st, bl, br, cr, dr, gr, fr, tr, cl, sl , fl, gl, sn, sm, sp, pr, pl, sc, sk, sw, ar, qu, ir, er, ur, tw, and or. 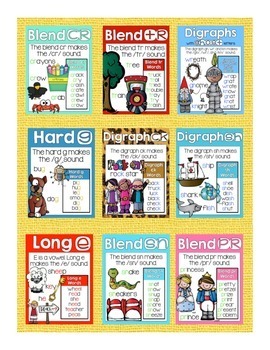 -digraphs: th, sh, ch, ck, wr, gn, kn, wh, and ph. 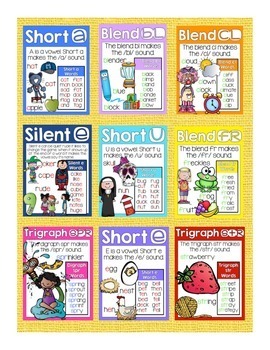 -trigraphs: str, spl, shr, scr, and spr. -vowel patterns: ay, ai, long a with silent e, ed, eed, eep, eel, long u with silent e, long i with silent e, and ore.
-long u vowel patterns: oo, ui, ew, and ue. Making your room look cute will not be hard to do!! !